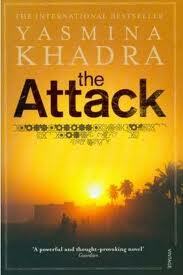 If I could give stars based entirely on the creativity required to develop a unique idea for a novel, The Attack would undoubtedly rate FIVE stars. Dr. Amin Jaafari and his wife, Sihem, have made a good life for themselves. He is an Arab doctor, a surgeon, living in Tel Aviv. Despite the difficulty one might expect an Arab living in Israel to encounter, Amin and his wife are well-respected in the community and have made many Jewish friends. During a weekend in which his wife is off on a three-day visit to her family near Nazareth, a suicide bomber wreaks death and destruction on an outdoor café killing 20 people, including many children. Dr. Jaafari fights desperately to save as many of the injured as possible during 48 hours on duty at the hospital. Upon returning home, tired to the bone after endless hours of surgery, he finds that his wife has not yet returned from her weekend trip. As he sleeps for the first time in days he is awakened by a phone call from the hospital asking him to come back. When he returns he learns that his wife’s body has been discovered amidst the carnage at the café. As devastating as this news would be, he is then told by his friend, Navid, a local police detective, that his beloved, Sihem, is suspected of being the suicide bomber. As it becomes evident that she has indeed been responsible for this horrific crime, Dr. Jaafari’s world is shattered. How could this happen? Why did he not see any clues? He begins to question everything about their marriage as he himself is investigated by the Israeli police who wonder if he assisted her in any way. Once cleared, Dr. Jaafari breaks from his duties at the hospital and travels to the West Bank in a quest to find the answers as to who recruited his wife, how did they get to her and why was he so blind to what was happening. He is in a dangerous world of Palestinian terrorists but he is determined to unravel the mystery of why this happened. I am not certain exactly why, but the story seemed to drag a bit as he investigates why his spouse became a murderer. Had the book maintained the pace of the first half, this could have been a five-star account. I enjoyed it for the most part and I gave it ***1/2 stars.